Each treatment is called a “dive”. During a treatment – oxygen, under pressure, fills the Hyperbaric chamber, increasing the oxygen concentration within a person’s body 15 to 20 times normal at the cellular level. Increased oxygen tension accelerates healing processes and aids in recovery from certain conditions and maladies. Each session usually takes from 5-10minutes to achieve depth, 60 minutes for treatment and another 5-10 minutes to return to normal pressure. HBOT is safe, has few side effects with practically none that persist. Hyperbaric Oxygen Therapy has been clearly demonstrated to dramatically increase immune capabilities, assisting patients with problems ranging from chronic infections to complex disabilities, including pain and neurological impairment. It has long been known that healing many areas of the body cannot take place without appropriate oxygen levels in the tissue. Most illnesses and injuries occur, and often linger, at the cellular or tissue level. In many cases, such as: circulatory problems; non-healing wounds; and strokes, adequate oxygen cannot reach the damaged area and the body’s natural healing ability is unable to function properly. Hyperbaric oxygen therapy provides this extra oxygen naturally and with minimal side effects. What type of chambers do we have? We have two (2) Monoplace chambers are designed to treat a single person pressurized with 100% oxygen. How should patients prepare for treatment? Only clean cotton clothing is allowed in the chamber that is supplied by the HBOT facility. No cosmetics, perfumes, hair preparations, deodorants, wigs or jewelry are allowed in the chamber. The technician needs to know if any medications, including nonprescription drugs, are being taken by the patient, and patients are advised not to take alcohol or carbonated drinks for four hours prior to treatment. In most cases, patients should give up smoking and any other tobacco products during their treatment period, as they interfere with the body’s ability to transport oxygen. HBOT is administered in a private setting in state-of-the-art, monoplace chamber of clear acrylic. This allows our trained technicians to closely monitor the patient and permits the patient to readily see outside the chamber. Patients are in constant view and communication with the attending technician via an intercom or may watch a movie, listen to music, or just rest. Hyperbaric oxygen therapy is prescribed by a physician and performed under medical supervision. Although there are minor risks like all medical treatments, overall hyperbaric oxygen therapy is extremely safe. The risks will be discussed with you before you sign your consent form for therapy. The most common side effect is barotrauma to the ears and sinuses caused by the change in pressure. To minimize this risk, patients learn techniques to promote adequate clearing of the ears during compression or tubes may be inserted in the ears. Occasionally some patients may experience changes in their vision during their treatment period. These changes are usually minor and temporary. A rare side effect is oxygen toxicity which is caused by administering too much oxygen. What information does the technician need to know from the patient prior to HBOT? How does hyperbaric oxygen help brain injury or stroke? When cells in the brain die, either from trauma or lack of oxygen, blood plasma leaks out into surrounding brain tissue causing swelling and reducing blood flow. These otherwise normal cells go dormant because they can’t function without the appropriate amount of oxygen. 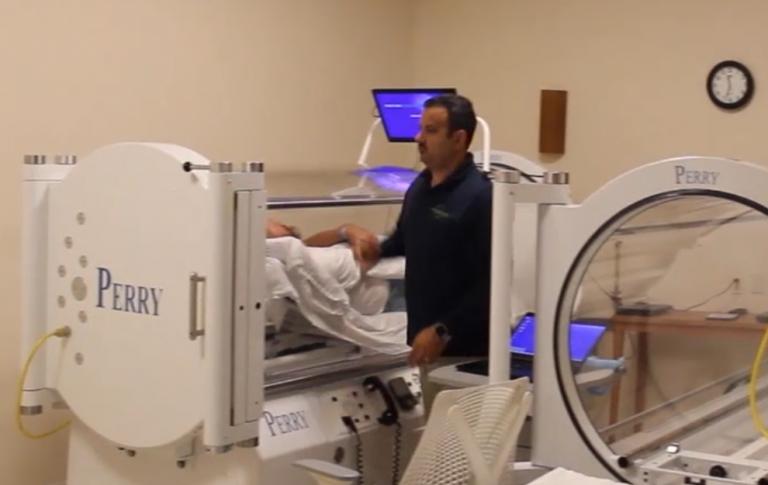 HBOT dramatically increases the oxygen carried in the blood plasma, making oxygen available to heal damaged capillary walls, preventing plasma leakage and reducing swelling. As the swelling decreases, blood flow can be restored to the dormant tissue (neovascularization) and these cells then have the potential to function again. How does hyperbaric oxygen help a child with cerebral palsy (CP) or traumatic brain injury (TBI)? In CP and TBI patients, some of the injured brain tissues may be “dormant” and non-functioning. HBOT can stimulate these “dormant” tissues and return them to more normal function. In young children, cognitive function and spasticity can be improved. Hyperbaric oxygen therapy, used in conjunction with other therapies, ensures the best recovery possible for children with cerebral palsy and traumatic brain injury.